El Gallo con Tacos i Santiago, Chile: Bestill nå! First thing to know about us is that we are avid travellers as well, putting much of that experience into creating a new and different B&B. Large and beautiful rooms, including 3 double rooms, operating from a 1941 Chilean house, totally renovated in 2008. Each room has been carefully design and decorated in the best tradition of Chilean guest-housing. Besides, this we have a cozy living-room and a big backyard patio including a grapevine structure, tables, chairs, water pond and all kinds of facilities designed for you to enjoy both the comfort and quietness of being at home. Being in a central strategic location with regard to the most prominent places in the city. 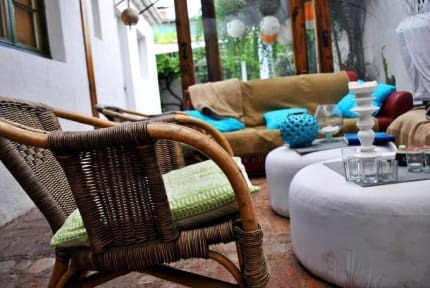 We are halfway between always cool Providencia district and cosmopolitan Santiago, at walking distance to Bohemian quarter Bellavista, Parks (Bustamante, Forestal, Metropolitano) and downtown. We have available reserves with and without breakfast (standard and economic respectively), but we always recommend to our passengers enjoy the breakfast we offer, because is very tasty, healthy and we have option for vegan, vegetarian and even for people with celiac disease. A helpful staff ready to answer any question and solve any problem you may have. Animals haters please take notice: there's a couple of cute dogs here, very friendly with people.